I find it very hard to write an article such as this because I don't know where to start. I especially find it difficult because Paul Schafer was one of my best friends. I'm sure I won't do justice to the man that few people really knew, but I'll try. On January 15, 1993 Paul stopped by my office to see if I wanted to go to dinner before we went to my son Brad's high school wrestling match on the evening of the 19th. Because I was extremely busy, I put my hand on his shoulder and told him I'd have to cut our visit short. I said that my brother (Gene) and I were already contracted to fly back to Philadelphia for a speaking engagement at the Greater Philadelphia Sports show the morning of the 19th. He said he would go to Brad's wrestling match anyway to give my son support. That's the kind of guy Paul was. Little did I realize that would be the last time I would ever see my friend alive. Monday, January 18th found Paul downhill skiing near his home on Big Mountain in Whitefish, Montana. He was skiing with artist/friend Tom Sander and former all-pro defensive end of the Miami Dolphins Doug Betters. Late in the afternoon, after negotiating icy slopes all day without falling, the expert skiers went out of bounds to avoid a series of icy mogels. Paul fell hard on the extremely steep, icy slopes landing head-first. He really built momentum as he slid down-hill for a hundred yards or so, coming to a stop when he hit a tree, breaking his neck in two places and rupturing his aorta. Even though he was undoubtedly killed instantly, Betters continued CPR until he was evacuated from the mountain. Paul was pronounced dead on arrival at the hospital. Very, very few people can appreciate what a loss the death of Paul Schafer was to everyone who really knew him. During his 44 years on earth he accomplished what an average man might live in ten lifetimes. Paul was unique in that he was blessed with a combination of personal characteristics that made him excel in everything he did. And still he was quiet and humble and kept to himself in the way that made you feel he was almost shy. Physically he was the epitome of the American male. He had a good looking, rugged, masculine appearance and possessed a natural strength, speed and toughness that were second to none. There was almost an air about the guy. He had excellent hand-eye coordination, positive mental control, confidence, intelligence and tenacity like no one else I've ever known. He would never give up. When I think of the combination of attributes that made up his personality, the following words come to mind; tenacity, endurance, strength, shooting skills, self control, woodsmanship and self confidence. Let's break them down and let me give you just one example of each as related to Paul's life. Tenacity: There's the story of Paul's 1984 pronghorn antelope that jumped the string and Paul's arrow broke it's front leg. Paul took off after the running antelope, keeping it in sight until it bedded. He'd try a finishing stalk only to have the pronghorn get up just before he got within bow range. The buck would bust from his bed and Paul would continue his running pursuit. When the buck ran, so did Paul. When he'd bed down, he'd try another stalk the best he could. He told me he felt it was just a matter of time. Darkness fell on the first day before Paul got him. He marked the spot of the bedded buck and walked to the nearest road, miles away, he hitched a ride back to his vehicle and hunting partner. The next morning at pink light Paul tried another stalk on the bedded buck only to have it move out once again. But he was getting closes. The second day the same story unfolded until late in the afternoon when the antelope stayed bedded long enough for the finishing stalk to come together and the final arrow found it's mark. Paul and his partner broke out the maps and estimated as best they could the distance of recovery. From where he first hit the buck to where he field dressed the animal...40...yes, FORTY MILES! Tenacity and relentless pursuit... that was Paul Schafer. 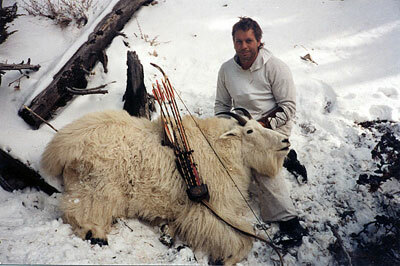 Endurance: Gene once hunted Dall sheep with Paul in Alaska. After a week of hard hunting Gene made the comment, "He ain't human...he doesn't get hungry; he doesn't get thirsty, he doesn't get out of breath, he doesn't get tired: hell...he's not of this world!" Strength: Paul Schafer's strength was legendary. I think he was just naturally stronger than normal but he was also into physical fitness and worked to keep in shape. He never tried to show off but he always "just happened" to do things that were super-human. There was the time I saw him lift my 230 pound brother by the ankles and shake the loose change out of his pockets while laughing. And the time he lifted a slate-bed pool table over his head with one hand while he held a Tequila Gimlet in the other. Or the time he threw a whole bighorn sheep carcass over his shoulders and walked up the mountain non-stop. Or the time he was spring bear hunting with Scott Koelzer and they got a flat tire on the rear of Scott's VW beetle. The jack wouldn't work, so Schaf lifted the back of the car off the ground while Scott changed the tire. These feats of strength were all witnessed by different individuals and Paul would just laugh and do it. Shooting skills: There was the time Paul and Tim Fox went elk hunting together. Tim shot a 330 inch plus bull and a few days later bugled in a mature 5x5 bull with Schaf. The bull came into under 20 yards and Paul let him walk away. As the bull walked out to 65 yards Tim gave Schaf hell for passing it up. It was a nice, mature bull; it was getting near the end of the season; it was an easy downhill haul out, etc. Paul just shrugged his shoulders and said, "Yeah... you're probably right," then proceeded to bury his shaft up to the feathers in the bull's lungs at 65 yards with the first shot. Or the time he was scouting and they left their packs and Schaf's 35mm camera sitting on top of the stump. On the way back as they approached the stump, Paul's friend bet him ten bucks he couldn't hit the camera. First arrow...right through the ol' Nikon at what later was paced at over 90 yards...but he won the $10 bet and that was the important part! One time some rifle hunters had wounded a mule deer and were emptying their rifles at it as it ran across the prairie. Paul piled out of his vehicle and put the first arrow through the deer's lungs as it ran by at one hundred yards, finishing it off. He told the gun hunters they had better sight in their damn rifles! Self control: Paul passed up more big game than most guys dream about. A few years back he drew a mountain goat tag for Montana. We all knew what the outcome would be. Video cameras recorded Paul passing up big billy after big billy. Finally, late in the hunt, the camera recorded Paul slipping to within nine yards of a huge bedded goat. At ultra-close range Schaf pulled his binoculars out of his jacket, checked the horns and a put a shaft through his lungs. Two months later I put a tape to the goat and found it tied the number two head in the world. Woodsmanship: I personally don't hunt with very many guys. I'm a loner by nature, but loved to hunt with Paul and I did so off and on for close to twenty years. It was pure pleasure to hunt with the man. To watch how he moved through the mountains made you believe his animal characteristics came naturally to him. When we hunted together I personally never saw him make a mistake. When confronted in a hunting situation, where a decision must be made at the spur of the moment, I never saw Paul make the wrong decision. I never questioned his decision, I just accepted it because I knew he was right. he understood more about the movement of a bigger variety of game than anyone I knew. Self-confidence: Paul and his friends raised a total of $12,000.00 to pay for his Desert sheep hunt to fulfill his grand slam of sheep with the bow. On the eighth day of the hunt with less than 48 hours to go Paul passed up a nice ram at 30 yards. He said he didn't want "just another sheep" to hang on his wall to fill his grand slam. It came down to one last opportunity on the ninth day. Paul had a chance to slip an arrow through a single eight inch hole in the brush at 30 yards. Twelve thousand dollars, the hunt of a lifetime, his only chance to fulfill his grand slam depended on that one shot. The arrow flew perfectly. He told me later that he knew it would because the night before he had gone over and over it in his mind, visualizing the arrow striking the ram right where he wanted it to. He knew it would happen...and it did. The sheep ranked number four in the world. Paul Schafer was the most humble man I've ever met. A couple days after his death, while going over some photos with a friend of his from Pennsylvania, we looked at the photo of Paul with his African lion. The man said he had seen the photo last August when he'd visited Paul while on vacation in Montana. I said, "That was quite a story behind that one wasn't it?" The man indicated that Schaf had shown him the photo but didn't tell him the story behind it. I couldn't quite believe my ears. I said, "Let me get this straight, Paul showed you this picture and never told you how he killed the lion?" The man said, "Yeah, what do you mean?" Paul "just happened" not to mention the fact that he killed the lion with his bow and arrow while it was mauling his white-hunter standing next to him! He was credited with saving the professional hunter's life but probably never mentioned it because the man might think he was bragging. Paul never bragged about anything. It was always his companions that bragged about him. Every year...year after year... one of Paul's hunting partners would come home with a story of " You should have seen what I saw Schaf do today...unbelievable!" I personally own six of Paul Schafer's Silvertip recurves. I not only shoot them because Paul was one of my best friends, but because I shoot them better than any other bows. They just fit me. After Paul's death I considered retiring them all. After talking it over with my sons and my brother, we agreed that Paul wouldn't want us to hang them up. He made them for us to hunt with and I will continue to do so. I'm also glad and proud to say that Paul's custom bow building business was bought by Dave Windauer. Dave worked in Paul's shop for several years and has decided to continue making the beautiful recurves of Paul Schafer's design. I'm sure that Paul would be proud of the craftsmanship that Dave is now putting into his own bows. Information on the Schafer Silvertip recurves can be obtained by calling Dave at (406) 257-0740 or writing him at 4657 Ashley Lake Rd., Kila, MT 59920. One of the most tragic parts of Paul's death was that he left a four year old son behind. It's sad to think that Paul's entire life changed after the birth of his son. Our 1992 family Christmas card from the Schafers was a picture of Paul with little Hunter strapped in the backpack, bugling elk on the top of Teakettle Mountain together. Paul lived for that little boy and loved him more than anything else in this world. There has been a trust fund set up for young Hunter. If any friends or readers would like to contribute, they can write to : Hunter Schafer Trust Fund, Piper Jaffrey, c/o Mike Carter, Box 229, Great Falls, MT 59403. Paul Schafer was an unbelievable individual. I have never, nor will I ever, meet another person quite like him. There's a difference between archers and bowhunters. There are bowhunters who excel at certain hunting techniques, but as a whole, it is my personal opinion that Paul Schafer was the best all-around bowhunter to have ever walked the face of the earth. I can only thank God for sharing a small part of our lives with such a unique man. There has not been a single day since his death that I have not thought about my friend. I will cherish our memories together forever. He was not only my friend, he was my hero. And I'll really, really, really miss him.